St. Gemma's Apostolate and Zeal for the Salvation of Souls. ‘Some days ago I had scarcely received Jesus in Holy Communion when He asked me this question: "Tell Me, My child, do you love Me greatly?" What could I answer? But my heart answered Him by its throbbing. "If you love Me," He rejoined, "You will do whatever I desire of thee." And then sighing, He exclaimed: "What ingratitude and malice there is in the world! Sinners persistently continue to live in crime. Weak and heartless souls will not do themselves violence to overcome the flesh. Those in tribula­tion lose courage and despair. Indifference keeps increasing daily, and no one amends. I cease not to dispense heavenly graces and favors to all My creatures: life and light to My Church, virtue and strength to him who rules it, wisdom to those who direct souls that are in darkness, constancy and fortitude to those who have to follow Me, graces of every kind to all the just. I send My light into the dark dens of sin­ners, and even there soften their hearts, doing all I can to convert them. But notwithstanding all that, what do I ever gain? What correspondence do I ever find in My creatures whom I have loved so much? No one any longer cares for My Heart and for My Love. I am forgotten as though I had never loved them, and as though I had never suffered for them. My Heart is always in sadness. I am left almost alone in My churches. If many assemble there, it is for other motives than worship, and I have to suffer the pain of see­ing My House become a theatre of amusement. Many, through hypocrisy, betray Me by sacrilegious Communions. I can bear no more." This loving Lord of all had previously made similar com­plaints to His servant to move her to offer herself as a victim of expiation for the sins of the world, and we have seen with what generosity she corresponded. Later on He will renew the same complaints to induce her to sacrifice even her life for the same end, and Gemma will, as we shall see, offer herself with equal readiness. Now He wishes to lead her to spend her whole being for the conversion of sinners. "If you love Me," He says, "you will do what I desire of thee," and with a clear light He lets her see the form of her apostolate in its smallest details. "You know o Lord," she answered, "how ready I am to sacrifice myself in everything. I will bear every sort of pain for You. I will give every drop of my blood to please Your Heart and to hinder the outrages of sinners against Thee." Let us see her in action. Of torments we need not speak, for she has suffered them in every way beyond measure and shed her blood, I may say, in torrents from her feet, hands, side and from her eyes and whole body, so as almost to leave no blood in her veins. But what works can this young girl perform to fit her to be an apostle of Jesus Christ? Let us have no doubt. By means of the Spirit with which Our Lord has filled her, she will achieve her mission perfectly. And what she does not reach by action she will certainly attain by prayer and tears. I am able to assert that from the first day that I came to know Gemma up to that of her death, I always found her exer­cising her zeal for the conversion of sinners. Gemma had found the secret of moving the Heart of her Jesus, and those innocent tears, those burning desires, that force of argu­ment that she managed so well, were always successful. On the last day we shall know how many souls have been dragged in this way from the clutches of the enemy by this humble virgin. It is certain that not a day passed without her praying for sinners. A proof of this is to be found in the register of her ecstasies through which, without being aware of it, she laid open her whole soul. "Oh Jesus, do not abandon poor sinners; think of sinners and of me. I want them all saved." And as she had always some particular sinner more especially in mind, "That one," she used to say, "I want You, Jesus, to remem­ber particularly, because I want him saved together with me." Remember my words: "together with me," -her persuasive eloquence of love. I will relate another fact in the words of a most reliable witness who told me of it. "I was asked," said this person, by a lady acquaintance to recommend her brother, a great sinner, to Gemma. I did so accordingly and she while in ecstasy began to plead to Jesus for him. But He [no doubt to try her faith] replied that He knew not that sinner. "How do You not know him," she said, "since he is Thy child?" Then she turned to Mary, but seeing that even she remained silent and wept, she began to pray to Blessed Gabriel of the Dolors [Passionist], and he also was silent. But Gemma, for all that, did not lose courage. She redoubled her prayers. At the same time she said to me: "That man must indeed be a great sinner. Jesus says He knows him not, Mother weeps, and Blessed Gabriel will not answer me." After a year of this assiduous praying, one day, while returning from church with Gemma, I met the servant of the above-mentioned lady in the greatest consternation. The brother of her mistress, she said, was dying. We were greatly pained, but we had only gone about twenty yards when Gemma exclaimed: "He is saved, he is saved." I asked her who? "The brother of that lady," she answered. I learned afterwards that this man breathed his last pressing the priest's hand precisely when Gemma was going home. That coincided exactly with the moment when she said aloud, "He is saved, he is saved." Gemma was often asked by friends to pray for sinners, owing to their high opinion of her sanctity. But it frequently happened that God Himself made such cases known to His servant directly, while she was at home, and by providential coincidences while she was out of doors. She was always ready to take charge of them whatever way they came, rejoicing in each one as if she had found a treasure and devoting herself the more earnestly to them in proportion to their number. "I would wish," she said, "to bathe with my blood all those places where Jesus is outraged. I would wish all sinners to be saved, because they have been redeemed by the Precious Blood of Jesus." The last one that she had in her mind, or, as she used to say, ‘that she carried on her shoulders’, was a gentleman of Lucca, a notorious and obstinate sinner, but not personally known to her. The charitable child labored long and earnestly for his conversion and renewed her assaults on Heaven without losing confidence. In her last sickness she said: "I am keeping him on my shoulders for the whole of the Lent, then he will be taken off." On Holy Thursday, the good priest who had recommended him to Gemma, all full of joy, told me that a great sinner had been converted in his hands. It was Gemma's sinner. Two days later, freed from that great weight, with another palm in hand, the Virgin of Lucca took flight to Heaven. This was the last conversion wrought through Gemma's inter­cession. The first, an interesting one, took place before she re­ceived the solemn investiture of her apostolate. It was while she was yet in her father's house, stricken by the dangerous disease that brought her to death's door. Among those who used to visit and nurse her was a woman who was found to be leading a bad life. Some of the family complained of this to Gemma, and she with her face full of animation replied: "Oh, then perhaps the Magdalene was rejected by Jesus because she was a sinner? Let her come; who knows that we may not be able to do her some good? Don't take her from me, I implore of you." And although in a dying state, she took the poor sinner in hand. It was a diffi­cult case as the woman lived by her own infamy. But what can­not the charity of Jesus Christ effect through a soul inflamed by it as was Gemma's? Her aunt of Camaiore, from time to time, sent her money to meet the grave necessities of her illness. And she, not caring for herself, passed it with exquisite delicacy to this woman, paying even the rent of her house so that the want of it might not cause her to offend God. And when any of the family asked what she had done with the money sent by her aunt she answered: "Hush! I'm not wasting anything, you'll see; you shall know the use I make of it." In this way, owing to her repeated attentions and the fervor of her untiring exhortations, she so pre­vailed with that soul as to wrest her from the hands of the devil. She got her to make a general Confession and from that time for­ward she has been leading a good life. Regarding some other soul, Gemma was once overheard in ecstasy to say "Jesus give me this soul. In exchange I will give you three years of my life. Another time she said "....I am willing to give the last drop of my blood to satisfy the Heart of Jesus, to prevent the offenses of sinners." Two days before she died she was overheard still barganing thus for souls. Certainly Satan must have growled with rage at the zeal of this holy girl, finding how she snatched his choicest victims from him. He often appeared to her with eyes of fire and in threaten­ing tones said: "While acting for yourself, do as you please, but listen well, do nothing for the conversion of sinners; if you attempt it, I shall make you pay dearly for it." At other times assuming the role of prudent counselor he would say: "How and where comes such presumption? You are laden with sins, and all the years of thy life would not suffice to bewail and expiate them, and yet you lose time about the sins of others? Do you not see that your own soul is in danger? A strange gain, that of think­ing for others and neglecting thyself." But all was in vain. Once she was heard to say to Our Lord in ecstasy: "Do You wish to know, Jesus, who has forbidden me to think about sinners? The devil. On the contrary, Jesus, I recommend them to Thee. Think of them, oh Jesus, poor sinners, and teach me to do as much as possible to save them." 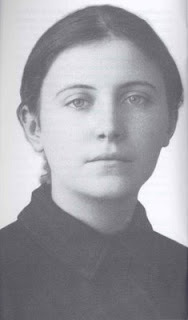 Without explaining my whole story, I will just say...Saint Gemma made herself known to me about 3 weeks ago. I, a passionate lover of the Saints, had surprisingly never heard of her before. She has already, thanks be to God, blessed me with many signal graces..little miracles. I've been reading the links on the right hand side of this website for quite a while tonight...and have found myself in tears, joyful, hopeful tears! Thank you for putting this website together! May Our Mother and Lord bless all who read it! St. Gemma, pray for us! Thank you so much for your comments. I am really glad to hear that you are enjoying the website, and it is especially wonderful to hear of your devotion to Saint Gemma and also to hear of her "little miracles" on your behalf. Thank you again for your comments and may God bless you and yours! Thank you so much for this website. We all can learn so much from St. Gemma. May God bless you for providing this oasis of inspiration I am so happy to find myself in - I happily return day after day, humbled and riveted by the example of this beautiful, holy saint. I am glad to hear that you enjoy the website. I meet St Gemma today while researching on St Maria Goretti. I am too a great sinner, but God loves me so much He died for my sins, as I remember this, I am really moved by such love and passion of the lord for me. Thank You, Jesus for saving me, for loving me despite my sins. Never abandon me, for my hearts desire is You, please place a zeal unto my soul, to be with You forever. Thanks for your wonderful comments and prayer. With all my heart, I ask for your prayers for Eric McDonald-Pray for God’s grace and mercy to be with him. I am in despair. I ask that St Gemma to help and heal me. Everyday I wish for death. I pray that St Gemma helps me. May Jesus encourage and strengthen you. In Jesus holy Name, amen.